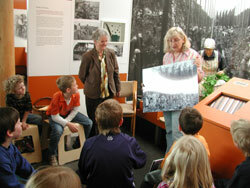 We offer special educational programs for school classes and groups of children. These programs are carried out by trained personnel. You can prepare and follow up on the visit to the museum in a special room devoted to this purpose with space for up to 40 children. During a museum rally children, either alone (from 10 years on) or accompanied by adults, will be invited to approach the subject of hop culture and hop growing in a playful way. Puzzles, games and the joy of discovery make the visit an unforgettable experience and help children to get acquainted with this exceptional plant called hop. In the museum, children can experience hops with all senses. How does the scent of hops differ from other typical scents? Touching a hop cone, do you recognize its characteristics? Will you be able to spy out the hop bread from all the other kinds of bread? Which one of the tin’s contents sounds like hops? Hopfenzupfer nannte man die Leute, die früher den Hopfen mit der Hand ernteten. Wir durchsuchen zuerst gemeinsam den Reisekoffer eines Hopfenzupfers, sehen uns alte Bilder an und schauen der Hopfenbäuerin in den Hopfenzupfer-Kochtopf. Dann hören wir Erzählungen von früher, wie es zugegangen ist bei der Ernte und was man hier so alles erleben konnte. Anschließend dürft Ihr Euch als Hopfenzupfer verkleiden und wir spielen einige typische Hopfenzupferspiele. Und es gibt ein spezielles „Hopfenzupferbier für Kinder“ aus alten Bügelflaschen. The workers who were picking the hops from the vines by hand in former times were called hop pickers. First we will all together explore the suitcase of a hop picker, take a look at old pictures and watch the hop farmer’s wife cooking a meal for the pickers. Then we will listen to stories from past times telling us about what the hop harvest was like in the old days and about all the exciting things around it. Finally, you may dress yourselves up as hop pickers and we will play some typical hop pickers’ games. And there will be a special “hop pickers’ beer for children” that can be tasted from old swing top bottles. Hop is climbing up on high wire trellises which can be seen everywhere in the Hallertau landscape. The men who set up these trellises are called “trellis builders”. First we will have a look at the museum’s large hop garden and learn how hops were grown in former times when there were no trellises. Then an old trellis builder will tell us about his profession and about the hardships and dangers of his work. Finally you will become trellis builders yourselves. Together we will set up a small hop trellis from wood and wire for you to bring home. Why do hallertau farms have towers? If hops are not dried immediately after harvesting they will go bad. Therefore Hallertau farms are equipped with a towering hop kiln in which the hops are dried. First we will have a look at the big old kiln in the museum. We will listen to stories about working with these kilns, about the serious risk of fire, about two weeks without sleep and about how firewood was gathered with the help of explosives. Then we will all together build paper models of the famous “German kiln”. Later you can take your own model home with you. A 20-minute introductory film from a detective’s perspective will help the kids to understand how hops are cultivated today. Major work phases in hop cultivation and main characteristics of the hop plant will be made plain in a playful way.